St Andrew's graduates: St Andrew's Anglican College sing as a group one last time before parting ways as young adults. 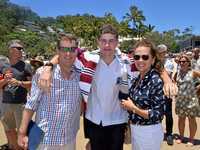 Year 12 students from across Noosa said goodbye to high school last week with the traditional dip at Noosa Main Beach. Emerging from the water on Friday, St Andrew's students welcomed the start of the next chapter as family and friends joined in the celebrations. Graduating student Lola Glover said she was looking forward to taking some time out before getting stuck into a double degree at university. "I'm happy about the freedom now," Lola said. "And not having to get up so early for school. "I'm taking a gap year and then going to QUT. I'm studying creative industries and business." Parents Peter and Leesa Heiniger were waiting with a dry towel for son Blake as he resurfaced in his soaking wet formal uniform. "He's our second one to finish high school," Mr Heiniger said. "There's no more children at school now. We had both our kids go through all 13 years at St Andrew's and they loved it. "We love the school; the community, the spirit, it's been great. "They put the kids first, teach them a lot of good morals." Blake said he would forego celebrations this week to work towards his goal of becoming a professional golfer. "I'm heading to Melbourne with Dad to play golf," he said. "I work at Noosa Springs Golf Course, I'm pretty lucky to have that job." About 22,000 high school graduates are expected to make the pilgrimage to Schoolies hot spot Surfers Paradise this week. Other sources are reporting an increase in the number of teens heading to Europe to celebrate their new-found freedom.